Watch full One Piece Season 15 Episode 3 English Dubbed full HD online. One Piece Episode 519 English Dubbed online for free in HD. Robin finally makes it to the Thousand Sunny and reunites with Franky. The archaeologist reveals to Franky that she is the eighth person who saw Rayleigh, as Luffy has yet to appear. Meanwhile, Chopper learns that he is the real one while discussing with the Fake Straw Hats and it is revealed that the Fake Straw Hats have recruited more than 100 pirates to their crew. At a Marine base, Sentomaru and the Pacifistas depart for the Sabaody Archipelago in response to Luffy’s return. At a fashion shop, Nami buys clothes for 90% discounts and Sanji and Zoro walk around town. Chopper chases after the Fake Robin, but Nami and Usopp find him. Chopper finally realizes that the real Nami has arrived and the three depart for the Thousand Sunny. 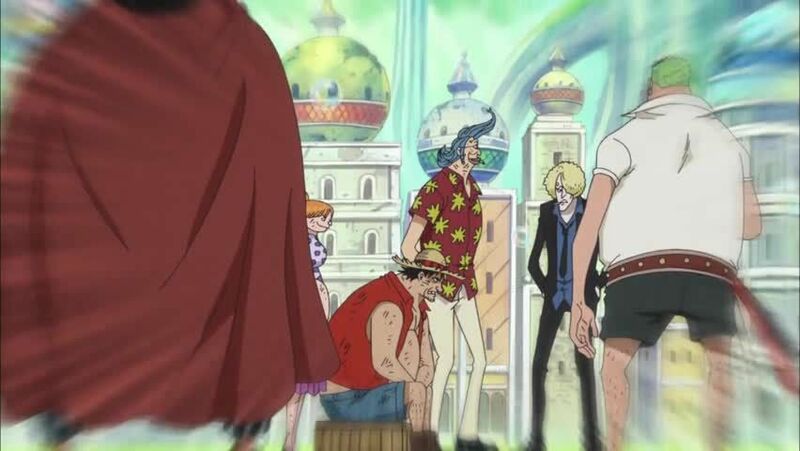 The Marines encounter a group of pirates gathered for Fake Luffy’s arrival, including Caribou and Coribou.